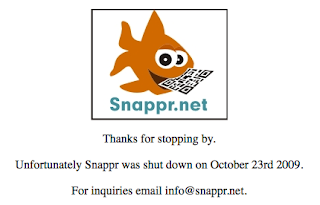 As I was finishing my preparations for my cell phones in education presentation today, I was checking my QR Codes, and I found out that he site I had been using for generating my QR codes has ceased operations. 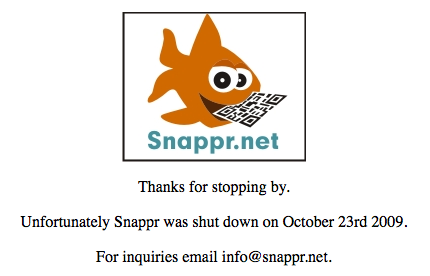 This also means that the QR codes I had created to show do not work anymore, as they work through the site snappr.net (don't go there, they have been shut down). While I understand that services such as this may not be able to survive in the current economy, it would have at least been nice to have received some notice about their impending doom (they did get my email address when I registered). But that's neither here nor there, and I appreciate that they did exist at one point in time so that I could become aware of QR codes. So, I am now in search of a new QR code generator. The first one I am going to check out is Kaywa. I hope it works well. If you have any suggestions for other ones to check out, let me know! I like that http://www.qrstuff.com gives you the option to generate a code and print it on a t-shirt. I'm a big enough nerd to take advantage of that option.